Charging cords charge at different rates. Let’s break it down. A battery stores electrical charge. It uses that electrical charge to power things. When we charge a battery, we are putting charge from the electrical grid into the battery. The max capacity of a battery is defined by two things: the amount of charge it can store (in Coulombs, Electrons, or milli-Ampere hours) and the voltage or “energy” in each of those charged particles. You will often see those two components, amount of charge and voltage, multiplied together giving you the energy in the battery (Watt-Hours). Scooter batteries are ~36 Volts but variable in charge capacity. Now we need to figure out how long that will take to charge. The charger that Bird supplies chargers with is rated at 42 Volts and 2 Amps. The charger voltage needs to be above the battery voltage in order for charging to happen. Each Amp is 1 Coulomb per second. So this cord is able to apply 2 Coulombs / second. Dividing 18,700 Coulombs / 2 Amps we get 2.5 hours if the cord is operating at full output the whole time. But the charging cord isn’t able to output at 2 Amps the entire time. As the battery becomes full, the charging cord has to slow down so it doesn’t overfill the battery. That’s why you will often see charging from 0-50% is much faster than charging 50-100%. Adding on a fudge factor, we get 3-3.5 hours to charge the ES2 battery. 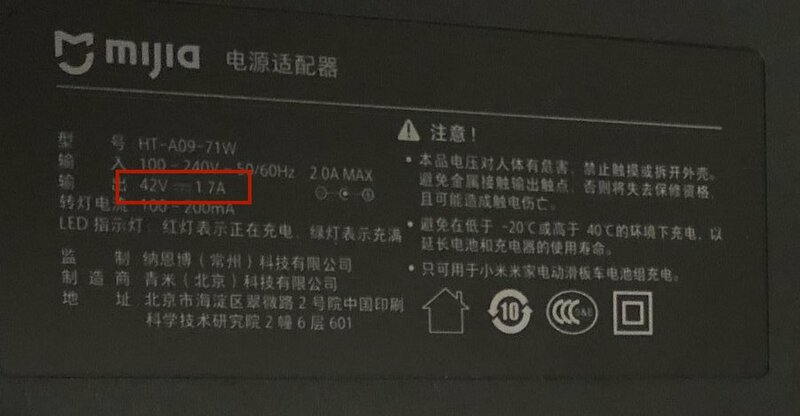 You can find these numbers on the brick (transformer) that comes with each charging cord. For example, in the picture below, the cord outputs at 42 Volts and 1.7 Amps. Any questions about this? Please contact us.